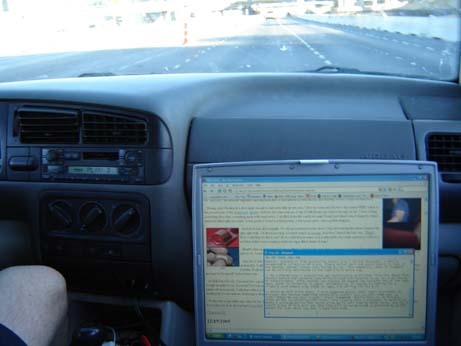 Why is a picture of this car included in this post? Because it’s flipped over.
.: My iPod of two years is on the verge of total breakdown, so before my brother and I embarked on our New Years Eve journey, we stopped by a not-so-local Half Price Books to search for cassette tapes. We found them rather quickly, but unfortunately there were none which we actually wanted to hear. That did not, however, prevent us from purchasing Robert Cray’s Strong Persuader, a wholly unremarkable collection of bland, bluesy guitar work one would expect to hear on the weather channel rather than inside my car. This momentary lapse of judgment can be entirely attributed to the tape’s $.50 price tag.
.: We suffered Cray’s uninspiring yet technically proficient licks for about five minutes before the cassette tape malfunctioned and revealed to us its true source of entertainment. After another two minutes we popped the cassette out of the tape deck, never to listen to it again. Incidentally, if anyone is looking for a slightly used Robert Cray album on tape, I’m selling one for $.55.
.: While at Half Price Books, I also happened across their small assortment of 8-tracks and learned something potentially useful: you can sell them your homemade compilations for cold, hard cash. Think of the lucrative possibilities! This clearly sets a precedent in Half Price Books’s exchange policy that would allow me to sell them my burnt CD-Rs, and for a retail price of only $.17 per disc they would be hardpressed to minimize my profit margin for just about any deal I make with them. Fun Fact: The white building on the far left is actually taller than the green building in the center.
.: Our final transaction at the book store included the aforementioned Robert Cray tape, two more cassettes, and a collection of epic narrative poems of the romantic period on tape. 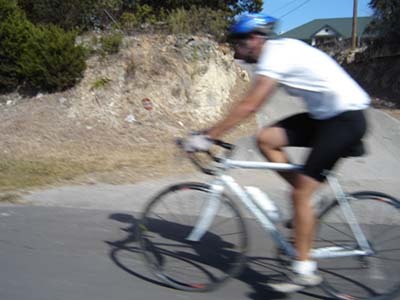 With that completed, we were on our way to New Braunfels, except that I wanted to see Susan before I left. So I drove an hour and a half out of my way to do just that, all because I could. It was nice though; we ate some pizza, and I almost had a full blown conversation with her sister — something both of us have been meaning to do for quite some time. 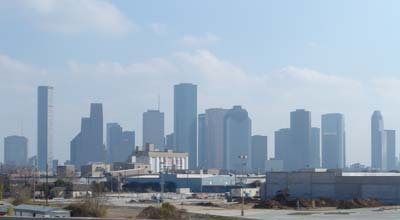 I left Susan’s house around 7:30, picked up my brother at 8:15, and left for New Braunfels at 9:00, which was the safest possible course of action we could do on New Years Eve.
.: Since I was driving, I had control of the radio — a condition almost completely ignored by my impatient brother. And since 9:30 is his regular bedtime, he was asleep for most of the trip, waking only to change every song thirty seconds before it would end. When he was not changing the radio, he was snoring, effectively ruining any chance of listening to those epic romantic narratives I bought earlier. I thought about poking his side to make him stop snoring, but I figured that would only make him angry. Then, after poking him, my prediction was confirmed.
.: When we arrived at the New Braunfels house, we discovered that our step-father had contracted some sort of Flu variant from London which he promptly spread to our mother. Sniffling and naked, she unlocked the gloriously opaque door and let us in. We stayed long enough to open our presents from Christmas, exchange pleasantries, and sleep.
.: The next morning, Dallas and I were on our way to the house of my dear friend, Geoff. 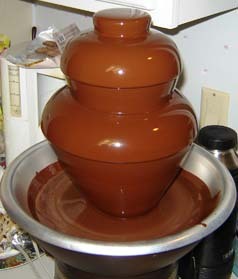 The first thing we did was set up the greatest gift a mother could give to her child: a chocolate fountain. 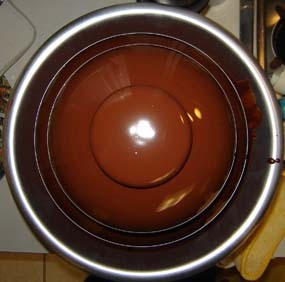 We bought five packs of Ghirardelli bittersweets, a bag of pretzel sticks, apple crisps, a pint of strawberries, and even a few chocolate bars to dip into the chocolate waterfall. Now, the last time I bought a raspberry-filled chocolate bar, I was sorely disappointed (see: Adventures In Memory, index.php?p=68). 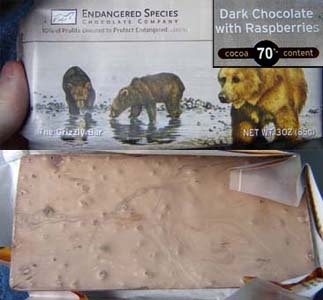 This time, I was downright enraged when I opened the endangered species brand of dark chocolate and raspberries bar only to find a dusty, lightly colored mound of cocoa crap. Sure, I indirectly helped save a bear with the proceeds, but really all I wanted was a good bar of chocolate with bits of raspberries in it. Is that too much to ask for?
. : Nevertheless, the chocolate fountain more than made up for the lackluster raspberry bar, and after gorging ourselves with gallons of chocolate, we made a trip to the local blockbuster video, where we happened upon what is sure to become a holiday classic: Santa’s Slay. It starts off with Santa, played by a 300 pound jewish Bill Goldberg, of WWE fame, crashing through the chimney of a spoiled rich family, which is composed of just about every celebrity you want to see killed: Fran Drescher, Rebecca Gayheart, Chris Kattan, and, yes, an uncredited James Caan. So, after immediately killing off all of the movie’s star power, the opening credits begin. The rest of the movie is full of unimportant plot points with periodic Santa slayings to fill in the gaps. If you want to see a kickass movie without any pretensions and if you don’t mind a few scenes of groan-inducing attempts at humor, then I wholly encourage you to rent — nay — purchase Santa’s Slay.
.: I would not, however, encourage you to rent The Gingerdead Man. Only when the opening titles splashed across the screen did we finally realize we were actually watching The Gingerdead Man instead of The Gingerbread Man. This movie was disappointing on so many levels. Well, really just two: it wasn’t hilarious like Santa’s Slay and it wasn’t hilariously bad like Vampires Vs Zombies. It lacked the obvious one-liners — where was “Run, run, run/As fast as you can/You can’t catch me/I’m the GingerDEAD Man!”? — and the ones they did use were cliches that could have been in any movie (“That’s gonna leave a mark!”). Also, the amount of disbelief one needs to suspend to watch this movie is far too great for any healthy human being to undergo. For instance, we are to accept that a 12″ tall demonic gingerbread man can drive a man into a wall, move a body, set up booby traps around all exits, and do this all in the span of two minutes. Also, he’s voiced by Gary Busey.
.: But before we watched that horrible movie, Geoff called up his other, less cooler friends and got us invited to a bitchin’ dock house party. There were no lights on when we arrived, and I had never met any of these people before. The effect was serene: imagine talking to complete strangers in person and still not knowing what they look like. Also, imagine one of them hugs you by lifting you in the air and spinning you around, and then imagine someone else, say, a good friend, decides he wants to join into the hug so he jumps on the both of you and then you all come crashing to the ground, possibly breaking your sunglasses, but more likely the expensive digital camera in your coat pocket. Keep in mind you don’t know the person hugging you. This person’s name and face will remain name- and face-less.
.: Throughout the night, Geoff, Dallas, and I remarked how eerily similar our evening’s location was to your typical horror movie environment. Among the topics reminiscent of every Friday the 13th knockoff were a dockside river house, a group of young teenagers, and one creepy older guy who kept singing perverted songs in Danish. 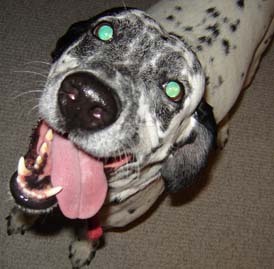 Surviving the night with all limbs intact, we returned to Geoff’s house where we finally shut off the motor to the chocolate fountain we set up earlier that day.
.: The next morning Dallas and I said our goodbyes to Geoff and his dumb dog Dover. 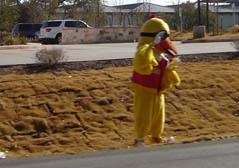 On our way out of Austin, we raced a cyclist (and won) and saw a man in a chicken suit on the side of the road*. Since I drove on the way over, it was only fair that Dallas drove on the way back. Fair, maybe, but not exactly legal ever since he lost his wallet a few days ago.
.: Nevertheless, he wasn’t pulled over, and I was free to do whatever I pleased during the drive back, including taking another self-referential picture of this post before it was actually posted. Doesn’t that just blow your mind? I will pay you $50 to clean up the house and to do the leaves. No, you do not have to make the beds. wow, that’s a pretty sweet weekend. i wish i were you. your life sounds fun. Your self referential picture was not taken in the jetta as the post would lead one to believe. What goes? $.55? a PIECE? I say post them on E-bay; with your writing skills you can get at least a few bucks a piece for them.